Make plans to attend the 23rd Annual Humble Police Association Crawfish Festival happening on April 26. 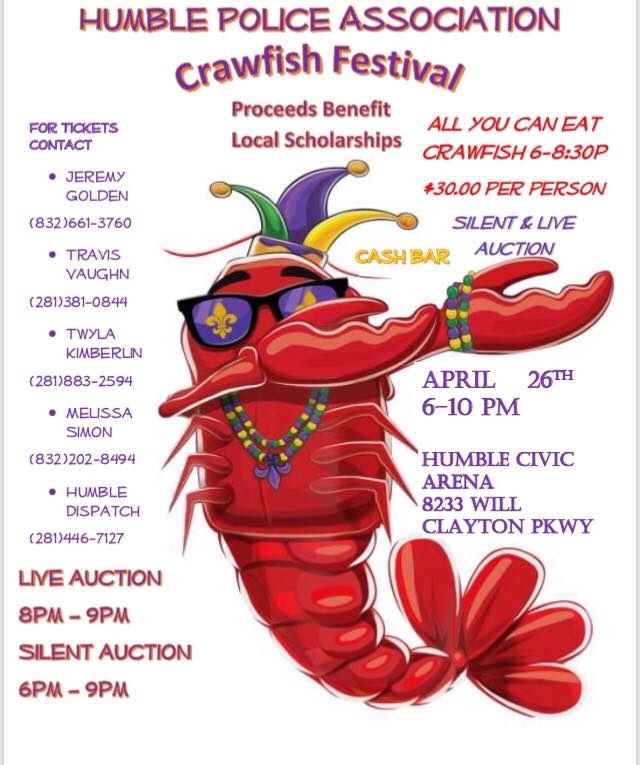 "Our 23rd Annual Humble Police Association Crawfish Festival will be held this year on FRIDAY, APRIL 26th from 6p - 10p at the Humble Civic Arena. Come and enjoy all you can eat crawfish from 6p - 8:30 pm, live music, dj, live auction starting at 8pm and silent auction from 6-9pm. Proceeds benefit local scholarships. This years theme is Mardi Gras! Laissez les bons temps rouler!"